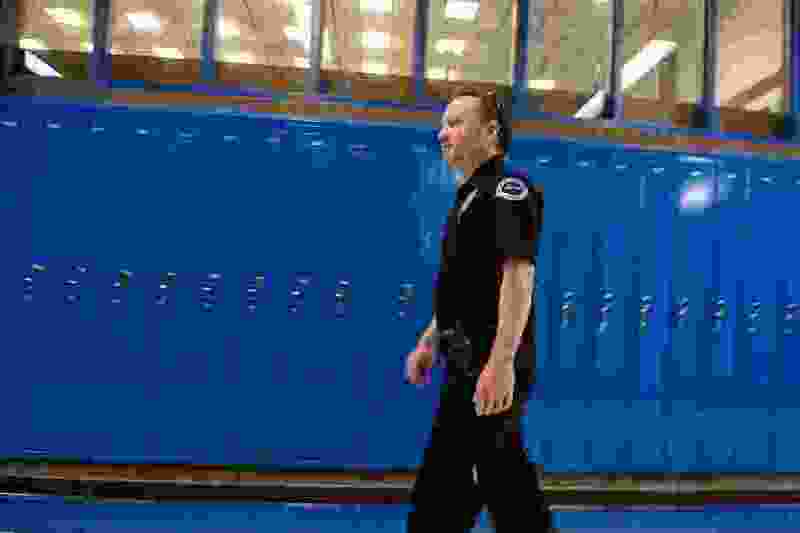 (Trent Nelson | The Salt Lake Tribune) Detective Scott Russell of the South Jordan Police Department on duty at Bingham High School in South Jordan, where he serves as a resource officer, Friday Feb. 16, 2018. Jessica Reynolds worried first about the school’s doors. They lock automatically but sometimes a student will leave one propped open with a rock or a stick. Then she fixated on the parking lot. When she walked to the front office, she scanned the cars. Is someone sitting out there studying the entrance? Are they waiting for an opportunity to come in? Would anyone stop them? In the four school days since a gunman killed 17 people at a Florida high school, Reynolds hasn’t felt at ease in the Utah classroom where she teaches music. Everywhere she looks she sees holes in the security. “My school could be next,” said Reynolds, who works at Draper Elementary School. And if it were, she’s not sure the staff would be prepared. While they practice shelter-in-place drills, the intercom indiscreetly announces “we have a stranger in the building.” And it’s only done when students are told ahead of time and are already in their classrooms — which usually isn’t the case with lunch and recess and assemblies. But finding a solution that encompasses all of the problems is like trying to find one right answer to a Rorschach test. Reynolds disagrees. She worries about locking a gun in drawer and having a student find a way in. She thinks about carrying one around her waist and having it discharge accidentally as she teaches kindergarteners to dance. She imagines someone aiming for a shooter but hitting a student by mistake. Utah doesn’t prohibit concealed weapons permit holders from having guns in K-12 schools — though plenty of educators in the state doubt whether it could actually stop a shooting. Melissa Ewell Green, who teaches in Utah County, has a permit but chooses not to carry at school. “Is my small firearm any match for a wild-eyed gunman?” she asks. Instead, Green proposes getting more mental health professionals on campus and having smaller classes so educators can give more attention to individual students. Ben Horsley, spokesman for Granite School District, said in an active shooter situation educators should be focused on getting students to a secure space rather than tracking down a gunman. Granite School District, which covers 90 schools along the Wasatch Front, is unique in that it has its own 19-member police force. All of its security, including cameras and contracts for additional school resource officers with local city agencies, costs about $3 million a year. But their response time is cut down to about two to three minutes where a regular law enforcement agency could take five to eight minutes to get to a school. The Florida shooting, according to surveillance footage, lasted less than six minutes. “I want criminals to know that if you come onto our campus you will be engaged with a police officer,” Horsley said. In 2014, one of the district’s teachers had a concealed gun and accidentally shot a toilet (she later quit and pleaded no contest). It’s not clear, though, how many Utah teachers have permits. They are not required to tell schools. Some gun rights groups have estimated it’s about 1 percent of all educators in the state. Kelli Stebbins, a teacher at East Midvale Elementary, previously worked in law enforcement and got a concealed carry permit after the 2012 shooting at Sandy Hook Elementary School in Connecticut. She doesn’t want teachers to be required to have a weapon but said districts could pay for training or target practice for those who want it. Stebbins believes “banning certain kinds of weapons is not going to stop school violence”; there needs to be more trainings and more police officers. Reynolds proposes bag checks and better building design. As an educator, she grapples with whether she’ll also need to be a bodyguard to her students. It’s a dual role Reynolds never imagined. She has planned for it nonetheless. (Courtesy Photo) Jessica Reynolds, a teacher at Draper Elementary School, poses with her two daughters.